Congratulations to Elizabeth Coldewey and Elijah Balderas on being named April Students of the Month! Read more about these outstanding seniors by clicking the headline. Wednesday, May 1st from 5:30 - 7:00 PM, FHS Gym - Click headline for details. 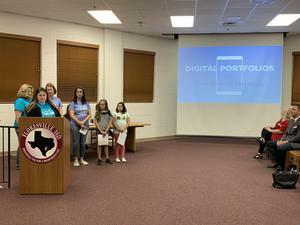 At the March Board of Trustees meeting, students and teachers from FNE explained how they use the Seesaw app to create digital portfolios that spark engagement for students and parents. 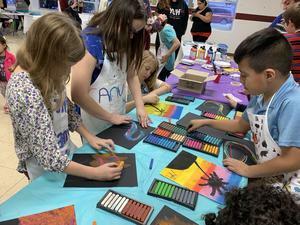 FISD is accepting referrals for Gifted and Talented (G/T) services until March 29th. We are committed to providing challenging learning experiences for students with exceptional intellectual and creative thinking abilities. Referral forms are available at each campus. Anyone wishing to refer a student attending Floresville ISD in 1st through 12th grade can pick up or request a copy of the referral form at their school office. This form must be returned to the school by Friday, March 29th, 2019. 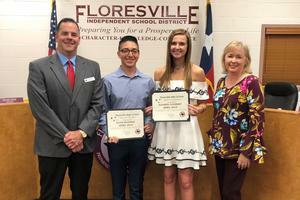 The FISD Board of Trustees recognized the March Students of the Month at its March meeting. 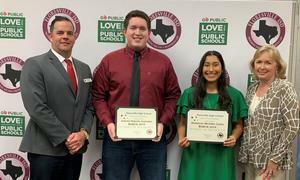 Congratulations to Maddy Castro and Antonio Gonzalez. Read more about these outstanding seniors. Join us for Go Public night at the San Antonio Commanders vs. Salt Lake Stallions football game! Buy one ticket, get one FREE! The first 100 students who purchase tickets will have the opportunity to high-five the players. All students wearing their school t-shirts to the game will participate in the Go Public pregame parade. Students must check in 1 hour before the game in section 101. Join the FISD Team as a substitute teacher! Read more about how you can get started soon. It’s time to put the FISD Strategic Plan in motion! FISD invites you to be a part of the Strategic Plan Implementation Team. Join us for the first meeting on Wednesday, February 27th from 4:15 P.M. until 6 P.M. Click the headline for more information.